Red Pocket Mobile is running a giveaway sweepstakes on Facebook. Prizes are a MiFi hotspot and an iPhone 4 16GB. The MiFi comes with 30 days of service on RedPocket's $30/month mobile broadband plan which includes unlimited data with the first 3GB at HSPA+ 4G speeds. The iPhone winner gets a free month of service on RedPocket's $49.99 unlimited plan. 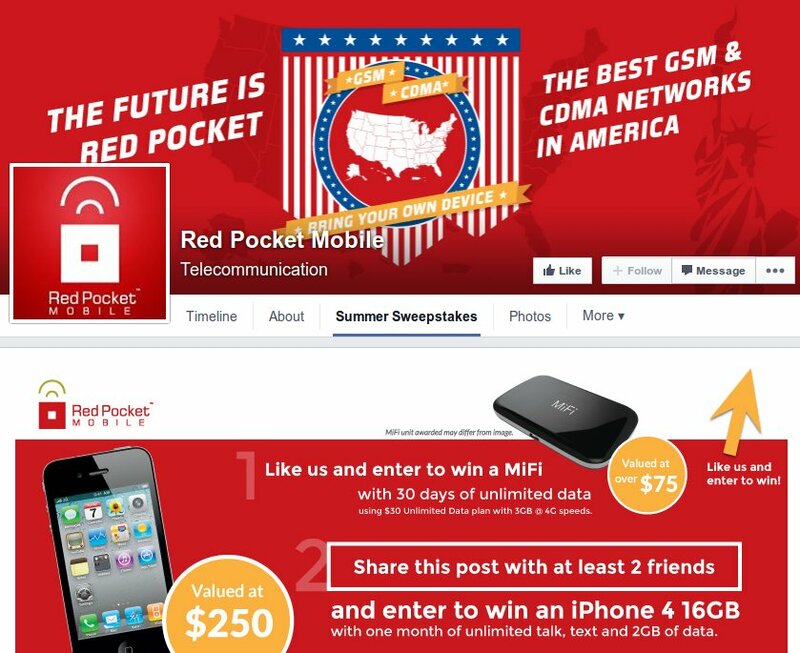 To enter to win the MiFi you just have to like RedPocket's Facebook page and then fill out this entry form. Entries must be received by 11pm PDT on July 13th, 2014. To win the iPhone there's an additional step. When you enter to win the MiFi you get a unique bit.ly link that points to the MiFi sweepstakes entry form. To be eligible to win the iPhone you need to share that link with your friends and at least two friends must enter the MiFi sweepstakes. The more friends who sign up through your bit.ly link the greater your chance of winning the iPhone. Good luck to all who enter. The MVNO market is so competitive with so many companies entering and a few other ones that fail. However, I like what Red Pocket is doing by resaling more than one National Provider's cellular service. This method obviously works. Tracfone has done this for years and they have over 25 million Americans. I'm surprise more new MVNO companies haven't adopted this technique. Unlike Tracfone you don't need a bunch of different company names just have one company name and sell multiple providers. Yeswap do you have an idea about how many customers Red Pocket, H20, and Airvoice have? Red Pocket is getting a bad reputation on throttling data. Breaking news guys Yeswap have you heard heads up Verizon Wireless FINALLY allowing LTE on their prepaid plans July 17 about time!